One hundred years ago, the SENĆOŦEN, or Saanich, language enjoyed a healthy vitality among the Indigenous W̱SÁNEC people of southwest British Columbia and south Vancouver Island. In 2014, 18 years after the last residential school in Canada closed, only six people were known to be native speakers of the language. Keeping an Indigenous language preserved is a great challenge that requires more than just a grant from the government. This year’s federal budget dedicates $5 million to preserve Indigenous languages over the next year, and the First Nations Cultural Council in British Columbia has contributed an average of $1 million a year since 1990. 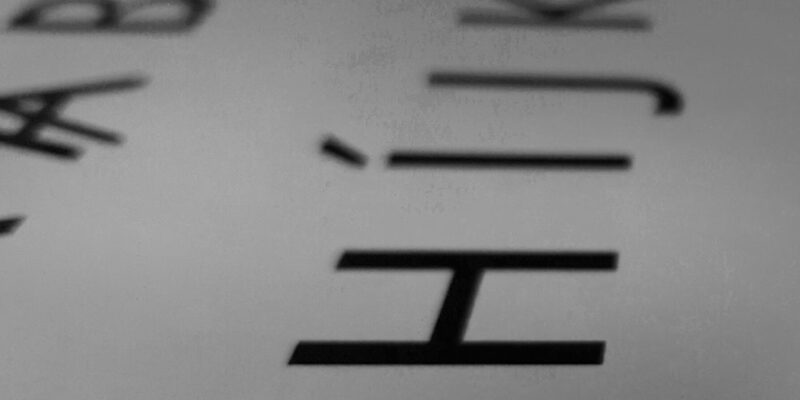 However, the Cultural Council estimates that $20 million is needed to document languages in British Columbia alone. Additionally, all aspects of Indigenous communities — including housing, elder care, and education — need to be vibrant to allow a successful revitalization, and not all receive adequate funding. 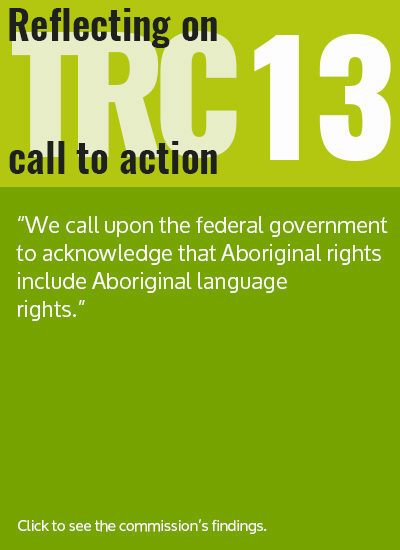 The Truth and Reconciliation Commission report’s Calls to Action reinforce the Canadian government’s responsibility in keeping Indigenous languages alive. However, the Commission does not lay down a precise guideline for how preservation should occur. 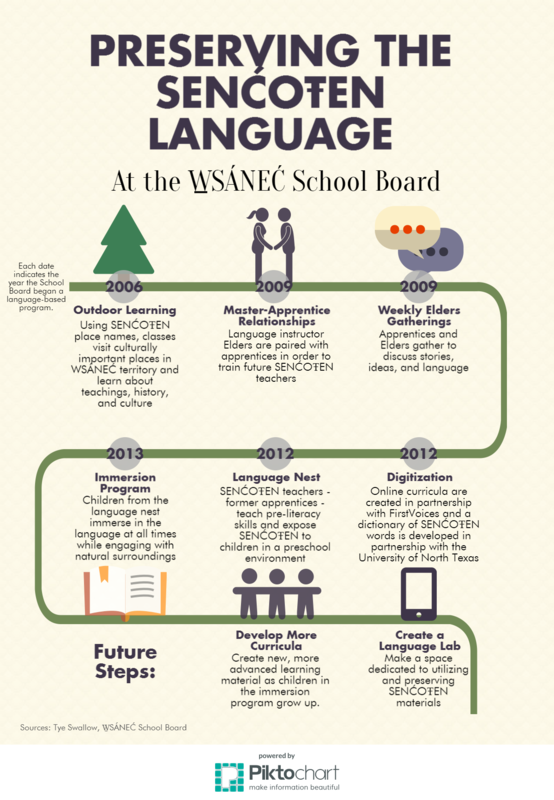 On the other hand, when the W̱SÁNEC School Board in south Vancouver Island established the SȾÁ,SEN TŦE SENĆOŦEN apprenticeship program, they knew that deliberate procedure is key to a language’s successful preservation. The two-month program was created in 2009, lasting until 2012. Beginning with six people, each enrolled in a SENĆOŦEN education degree at the University of Victoria, a total of 16 apprentices were trained by fluent elders to gain proficiency in the language, the goal being to be able to subsequently teach children the language in an immersion environment. Now, the apprentices use the skills learned in the program to teach SENĆOŦEN to others. Each year, they develop a higher-level curriculum for children enrolled in the SENĆOŦEN Survival Immersion Program. This year is the debut of the grade-three curriculum. Indigenous languages can have powerful effects for not only Indigenous communities, but the broader population as well. Evidence also shows that, even though revitalization costs money in the short term, it saves money in the long run. “In general we find a high correlation between other indicators of social problems – high depression, suicide and alcoholism rates, high unemployment, crime, and so on – and loss of language,” Grenoble says. The money spent dealing with social issues typically costs more than preservation. For instance, StatsCan says that the average cost of a prisoner in a federal prison from 2013-2014, per year, was $108,770. As such, if the Canadian government were to double its $5 million budget for language preservation, they would actually make a profit if only 46 fewer Indigenous people were jailed as a result. THOMAS BOYER is a masters candidate at the Ryerson School of Journalism.